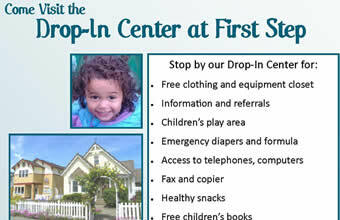 The Port Angeles Drop-In Center at First Step offers a safe place to find what you need for your family. 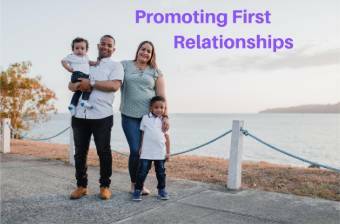 We have a free clothing and equipment closet, information and referrals, a children’s play area, emergency diapers and formula, access to phones, computers, fax and copier, healthy snacks, and free children’s books. 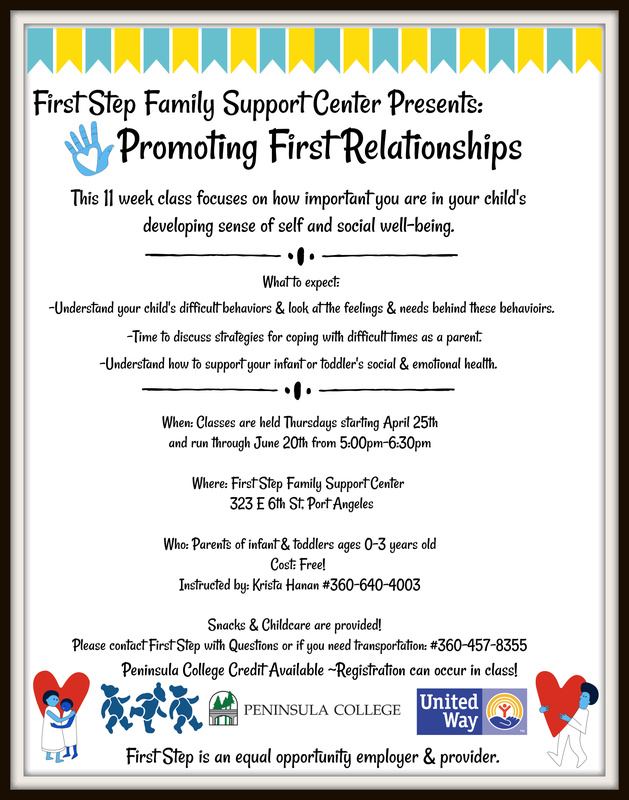 Promoting First Relationships is a free 11 week parenting class that focuses on how important you are in your child’s developing sense of self and well-being. Childcare and a light snack is provided at each class. Peninsula College credit available. Please reach out if you need transportation. 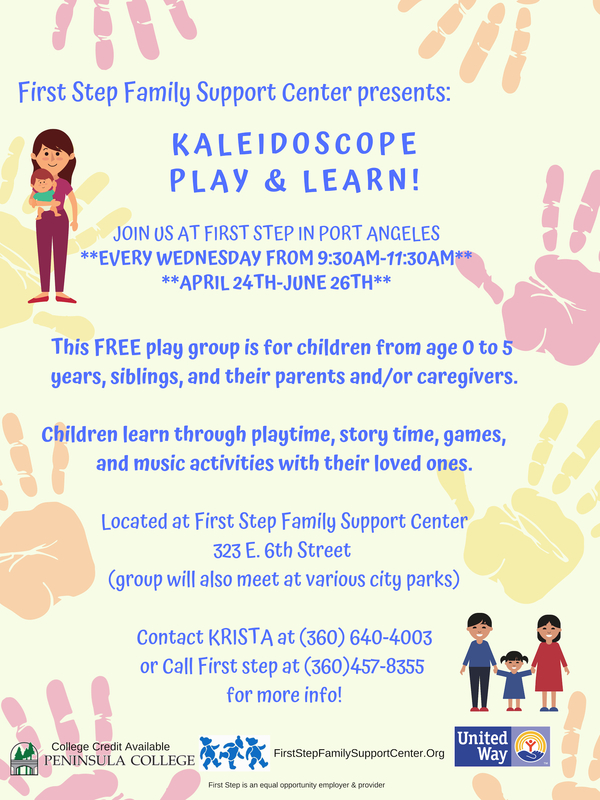 Babies and toddlers learn through playtime, story time, games, and music activities. 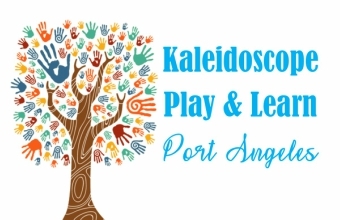 Age appropriate learning activities for pre-schoolers are provided through art, music, song and dance, circle and story time, literacy, science, and other activities. 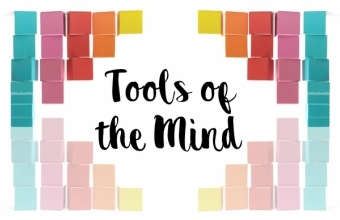 Tools of the Mind, a learning environment and curriculum that helps children become a master of their own behavior by building executive function skills so they can excel in school and life. 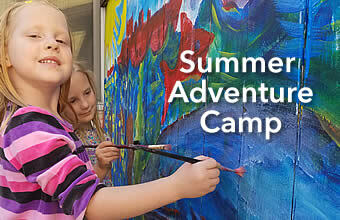 Summer Adventure Camp is a kindergarten-readiness program held during the summer for students entering Kindergarten. Arts and crafts, story time, songs, and games are used to help children prepare for the transition to public education.